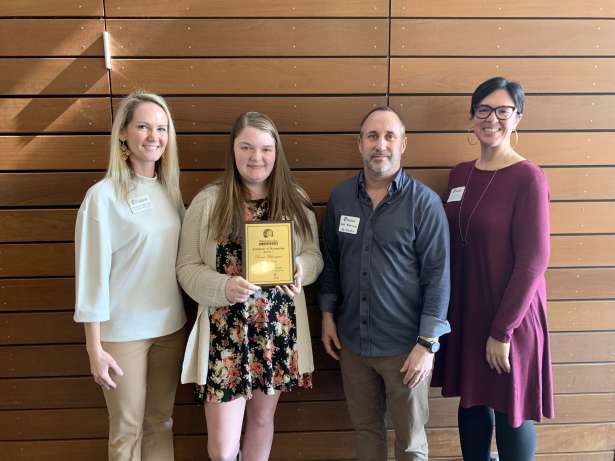 The Woodinville Chamber was pleased to honor our March 2019 Student of the Month, sponsored by Northwest Trophy & Award. This month’s featured student was Renee Witherspoon, a second year student at Cascadia College. Renee attended Woodinville High School prior to Cascadia College and is a positive leader and role model. Renee has a passion for ensuring all Cascadia students feel they have a sense of purpose and that their voice is heard. She spent her year on Cascadia Student Government engaging with students to make sure they know how their tuition money is spent. Renee takes the opportunity to talk to students, in class and out, to learn how their experience can be better. She has been active in the Cascadia Textbook Accessibility Program, making it possible for students to borrow textbooks if they don’t have the funds to pay for them. In addition to being active on campus and taking several courses, Renee also finds time to nanny in her local community and is deserving of this recognition and has strong interest and involvement in her community. Pictured here: Kimberly Ellertson (Director of Marketing, Woodinville Chamber), Renee Witherspoon (March 2019 Student of the Month) Robb Anderson, Northwest Trophy & Award (Student of the Month Sponsor), Becky Riopel, Director of Student Life (Cascadia College). Photo courtesy of Photography by Carol Hook.